Fairy tales have long been told and retold for generations now. They tell stories about love, hope, and dreams. It has been a common plot device used in movies, television series, stage plays, and novels. Fairy tales are also a common theme for celebrations such as birthday parties and weddings. Everything is grand and flashy, just like what you see in the movies. You may also see invitation designs. When it comes to sample wedding, a fairy tale theme is something couples can never go wrong with. Fairy tales speak to people of all ages and sweep people off their feet. They have made a mark in everyone’s hearts, especially on children’s. It has become a big part of their childhood. As a couple taking on this theme, you need to have an attractive design in order to recreate a fairytale-like ceremony. Take a look at these designs and choose one that suits your taste. Nothing can go wrong in following a fairy tale theme for the wedding. Just make sure it is designed well and creatively executed. Here are some of the reasons to use a fairy tale wedding invitation. Most sample wedding invitations are done simply and use minimal colors. 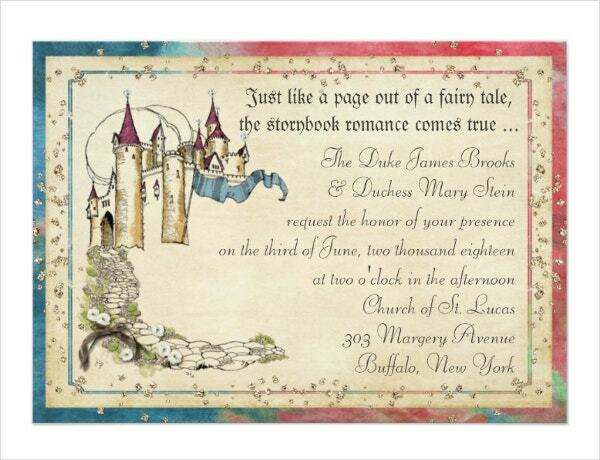 If you want to stand out, a fairy tale wedding invitation is a good option. You have to find a unique edge in your design and use it to your favor. You can also use a lot or minimal colors for the final design. Fairy tales usually take place during an imaginary time in the past. The fonts used are elegant and kind of medieval. Several fonts can be found online for that purpose. The cool fonts following a fairy tale theme are usually beautiful and seem to be taken out of a calligraphy book. Fairytale themes are an opportunity to unleash the creativity in you as a designer. 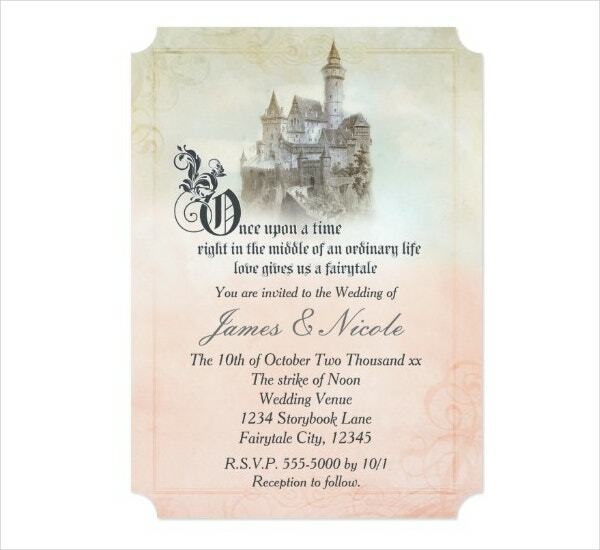 You can include palaces and carriages in your design to create the “once upon a time” feel. For example, you can use apples and magic mirrors if you plan to take on a Snow White theme. Mermaid tails and blue seas are good elements if you are following The Little Mermaid theme. 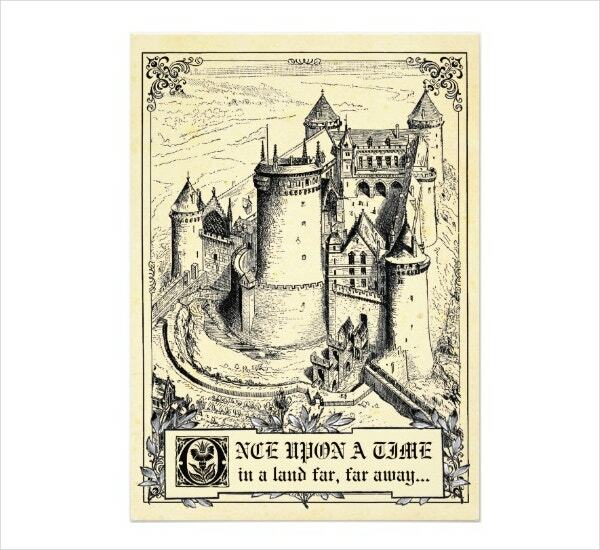 Use some items found in the most famous fairy tales to solidify your design. You may also see photo wedding invitations. What fairy tales never fail to do is make us wonder how it is to experience that kind of stuff for a celebration. Make a design that will evoke this sense of wonder in the people you invite to the wedding. 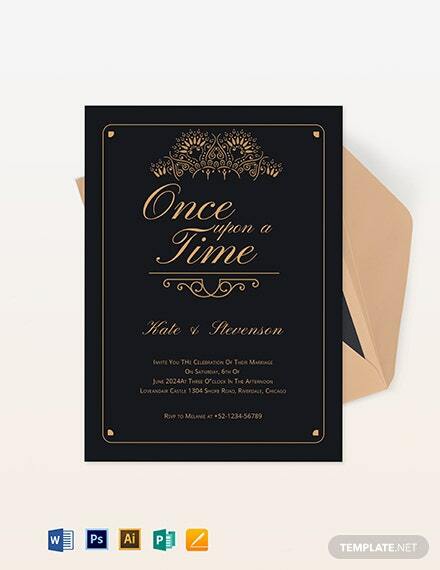 Fairytale simple wedding invitations can also serve as a keepsake for its exceptional design. It serves as a memento for a once in a lifetime event. It will make you remember a lot of things that happened during the ceremony. Having a fairy tale theme for your wedding needs a lot of planning and budgeting. You have to adjust some expenses to suit your taste. 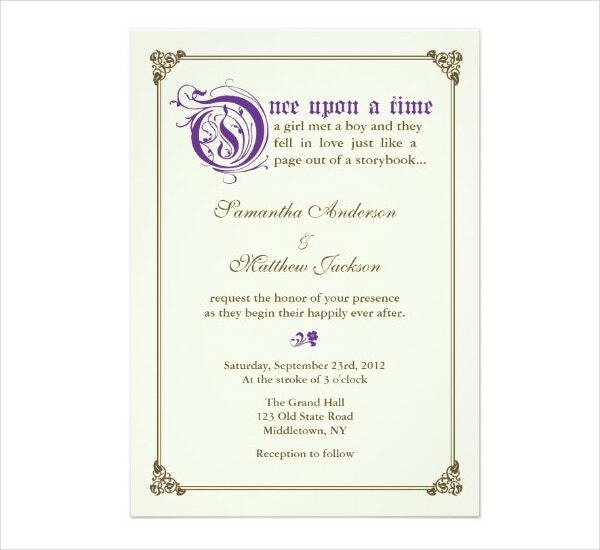 Here are some things to keep in mind when making a fairy tale modern wedding invitation. 1. Set the right budget. Designing invitations is not an easy task. You have to fit in everything in a small piece of paper to be printed after it’s done. You have to take note of some imperfections that might ruin the design. And most importantly, you have to pay the designer who will make the invitation. Set the right budget for this. Never pay the designer less just to save some money. The design takes hard work, skills and sleepless nights. Think of the designer’s part in the budget. Do not scrimp on his fees just to get a good deal. 2. Think of the design ahead. Invitations represent you as a couple and the whole event itself. Months before giving them out, think of a good design that will surely be memorable and attract the attention of your expected guests. Your traditional wedding invitation has the convincing power to attract guests to your wedding. Make sure that both of you agree on the design and to how the designer will make it. 3. Coordinate with the designer. You just can’t leave the designer alone after giving him the first draft of the design. You have to coordinate with each other, especially if there are minor changes on the design that has to be done. Keep an open mind in this. Some parts of your prospective design might not be carried out due to creative difficulties. Some might be added to make up for the parts that were removed. Do not be disappointed. This is just part of the process of design. Hire a designer that has great designing skills. Experiences help in carrying out the design that you want to achieve. It will assure you that they know what they are doing. With this, constant communication is the key to avoid failure and creative differences. You may also see vintage wedding invitation templates. By now, you have watched and heard every fairy tale which dates from centuries back. These fairy tales have been tweaked to suit the audiences’ taste. From tragic conclusions to happy endings, fairy tales are changed a lot to endear audiences worldwide. Here are some of the best fairy tales that’s been retold and have become familiar to all of us with their earliest original plot retained. You may also see beach wedding invitation templates. This fairy tale uses perhaps the most common plot device in television series across the globe. Cinderella is a poor girl who is mistreated by her stepmother and two stepsisters. She works as a maid after her father died. The three have been giving Cinderella a hard time. A ball at the palace invites everyone. Cinderella is not allowed to go but with the help of a fairy godmother, she gets dressed elegantly and attends the ball, much to her family’s surprise. She captures the heart of the Prince and they dance, but not before going home at midnight and losing her shoe. The prince gets the shoe and starts to look for the girl who matches it. Initially, the stepsisters insisted that their feet fit the shoe. Cinderella tried fitting the shoe, and as it fits, the prince knew it was her. They lived happily ever after. You may also see peacock wedding invitation templates. The famous line “Mirror, mirror, who’s the fairest of them all?” will surely ring a bell in every one of us. This tells the story of Snow White, the beautiful girl who was envied by the evil queen for being more beautiful than her. Her real mother used to be the queen of the kingdom, not until she dies and pricking her finger with a needle while sewing on the windowsill. 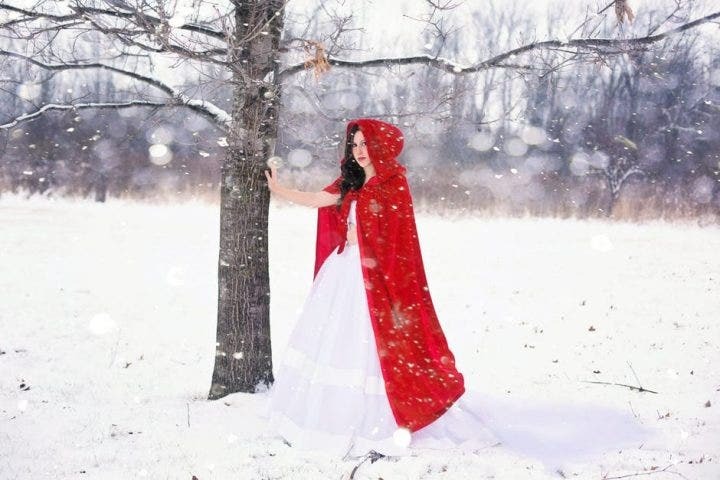 Three drops of blood fell on the snow and she wished to have a daughter whose skin is as white as snow and lips as red as blood. She died after giving birth to her child. The king, taking in a new queen, is a wicked one. You may also see wedding invitation samples. The queen asks her magic mirror who is the fairest in the kingdom and it tells her that it’s Snow White. Her anger made her order a huntsman send Snow White to the woods to be killed. Snow White runs away after she begged the huntsman to spare her life and ends up in a cottage occupied by the seven dwarfs. You may also see sunflower wedding invitation templates. The seven dwarfs took care of her. The queen, having a knowledge of Snow White’s survival from the magic mirror, attempted to kill her. The dwarfs always revived her to live. As a last attempt, she disguised as a farmer’s wife and gave Snow White an apple with poison. Snow White ate the apple and fell asleep. The dwarfs assumed that she was dead, so they placed Snow White inside a glass coffin. You may also like chalkboard wedding invitations. Later, a handsome prince found Snow White and tried to lift the coffin. The pieces of apple fell from her mouth and she wakes up. The prince is captured by her beauty and declares his love for Snow White. A wedding came next, but not with the queen gatecrashing the ceremony. As a punishment for attempting to kill Snow White, the prince made her wear a pair of hot shoes and dance until she died. The prince and Snow White got their happy ending. You may also see vintage wedding invitations. They say love goes beyond physical appearance. This is what Beauty and the Beast set out to do. The story starts off with a merchant with his six children. They all had the fortune in the world. His children, three girls, and three boys were all attractive and well-educated. Beauty, the youngest of them all, stands out by being the kindest and pure at heart. Her two sisters treat her more of a servant than a family member. You may also see sample gay wedding invitation templates. The merchant suddenly loses all of his wealth while he was at sea. He and his children are forced to live in a farmhouse and work for their living. After a few years, he heard that the ship that he sent off came back at the port and spared from the damage. He goes away to get the ship, only to know that all the cargo has been stolen to pay his debts. He couldn’t bring his promises of gifts to his children, as well as Beauty who only wanted a rare kind of rose. 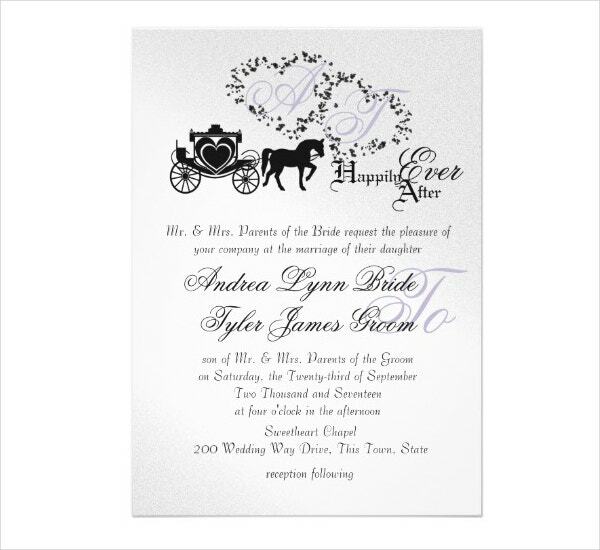 You may also see western wedding invitation templates. While on his way home, the merchant got lost in a storm. He stumbled upon a palace and a mysterious figure lets him in. Upon going inside, he comes across a table laid with food and drinks by the invisible host. The merchant spends the night there. The following morning, as he wanders around the palace grounds, he sees a rare rose and thinks of Beauty. He plucks it, only to be seen by Beast and get confronted. The merchant explains that the rose is for her daughter. The Beast, who owns the palace and appears like a monster, agrees on one condition. One of his children shall go into the palace, or he himself should return. He sends the merchant away with jewels and fine clothing for his children, while no one must know about their deal. You may also see fall wedding invitation templates. Eventually, Beauty knew of the deal. Her brothers were determined to go to the castle and fight off the Beast. Beauty decided to go to the palace in the end. The Beast welcomed her, and as fate would have it, he fell in love with her. Beauty only saw him as a friend. The Beast asked her to marry him to which she refuses. She dreamed of a handsome prince asking her to marry him. This led her to look for the prince in the palace halls but fails to find him, thinking the Beast might have hidden him somewhere. You may also see wedding invitation designs. For months, Beauty lived with the Beast. All her desires were given by the Beast from food, clothing, and other things. Beauty grew homesick and asks the Beast if she could go back home for a short while. The Beast agreed. Beauty went back home to her family. Her sisters got envious of her luxurious life so they convinced Beauty to stay longer. They even cried in front of her. Beauty stayed longer, swayed by the fake love her sisters have shown. You may also see creative wedding invitation cards. Soon Beauty broke her promise to Beast that she’d quickly return. She saw in the magic mirror that the Beast lay half-dead due to heartbreak on the roses where her father used to pluck one. She rushed to the palace to rescue him. She wept and told the Beast she loved him. The Beast transformed into a handsome prince that Beauty had been dreaming about. He told Beauty that he was cursed after he refused to let a woman on one rainy night. It was only true love, in spite of how ugly he is, that the curse can be broken. The two ended up happily married. You may also see elegant wedding invitation templates. Hans Christian Andersen’s 1837 fairy tale about self-sacrifice and the agony of love is perhaps the most memorable one. The ending of the original fairy tale is tragic but shows us how powerful love can be. The Little Mermaid starts off with the underwater kingdom where the finest mermaids and the clearest of waters can be found. The Little Mermaid, now 15 years old, gets fascinated by her sisters’ stories about the world of the humans. Mermaids are permitted to swim and see the human world when they are 15. The Little Mermaid swam to the surface, only to witness a disaster. She watched a ship where a birthday celebration for a handsome prince was being held. The ship got caught in a storm and eventually sinks. She rushed to save the Prince from drowning and brought him to the shore. She waited until a lady saw the prince. She felt sad for the prince never saw her or thought she was the one who saved him. Feeling a sense of love and attachment to the prince, she went to the sea witch to trade her tongue in exchange for human legs. Aside from losing her beautiful voice, the sea witch told her that every step she would take is painful. Longing for a human soul, The Little Mermaid agreed. She got a potion from the sea witch and goes up the surface. To have a human soul, the prince must love and marry her, so a part of his soul will flow into her. If it does not happen, she will dissolve into sea bubbles. She swam to the surface and drank the potion. You may also see wedding invitation samples. The prince found her on the shore near the palace. Having been mesmerized by her beauty, the prince took her in and became his favorite companion as he did his royal duties. He did not care about the fact that she was mute. She danced for him because he liked seeing her dance, even if the pain pierced through her legs like crazy. The Little Mermaid grew fonder of him. You may also see calligraphy wedding invitations. Later, the prince got introduced by his parents to the princess of a neighboring kingdom. Marriage plans were being made, and he objected, saying he didn’t love the princess. He said he only loved the woman who saved him from drowning and brought him to the shore. With some twist of fate, it turned out that the princess was the one who rescued him. He declared his love for the princess and soon the wedding was held. You may also like wedding invitations in PDF. This broke The Little Mermaid’s heart. All her effort were rendered useless. On the night of the wedding, as the prince and princess slept in a room on a wedding ship, her sisters arrived and gave her a dagger. They traded their long hair for it. If she wanted to be a mermaid again, she had to kill the prince and let his blood flow to her legs. 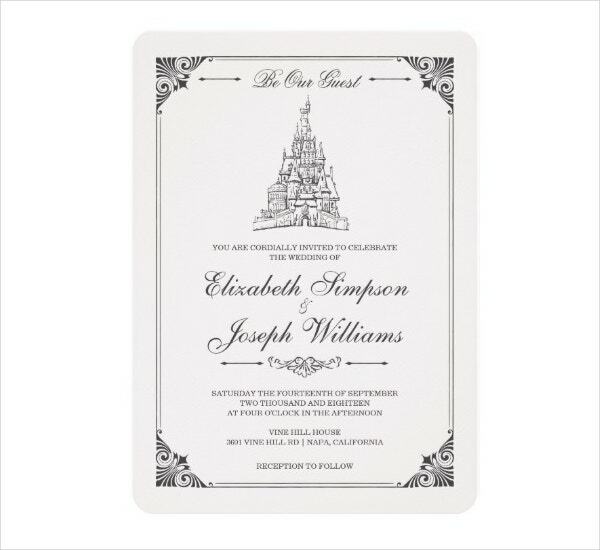 You may also see Disney wedding invitations. The Little Mermaid, out of her great love for the prince, threw the dagger into the sea. She threw herself next and she became a sea foam. She remembered what her grandmother said. Humans have a shorter lifespan than mermaids, and they have an eternal soul. She ascends into the atmosphere and must do good deeds to mankind for 300 years to gain a human soul. You may also see wedding E-mail invitations. This story of selflessness has been retold many times in movies and television. The most popular one is the 1989 animated film The Little Mermaid which had a happier ending than the original one. Mermaids have long been a part of pop culture and are used as plot devices along with the handsome prince, or leading man. You may also like printable vintage wedding invitations. This is also a familiar fairy tale to everyone. The story begins with The Little Red Riding Hood, a little girl who goes to her sickly grandmother’s house to bring her food. She always wore a red cape around her, hence her name. She had some wine and cake in her basket. She went out alone to the forest leading to her grandmother’s house. A Big Bad Wolf wanted to eat the Little Red Riding Hood and the food in her basket. He followed her while hiding behind trees and bushes, waiting for the right time to eat the little girl. You may also see photo wedding invitations. One day, as she walked to her grandmother’s house, she encounters the Big Bad Wolf. The wolf asked her where she was going. Little Red Riding Hood told him that she was going to her grandmother’s house. The wolf told her to pick flowers for her grandmother. Little Red Riding Hood obliges. She went out of the way to pick some flowers. The wolf went to the grandmother’s house and locked her up in a closet. He lay on the bed and wears some clothes of the grandmother. You may also see wedding invitation templates. When Little Red Riding Hood arrived at the house, she noticed that her grandmother looks different. She noticed that her voice got deeper and her eyes got bigger. The wolf could not hide his pretense and attacked the little girl. A hunter saved Little Red Riding Hood and the grandmother. He killed the wolf and everyone was safe. The grandmother gets out of the closet and reunites with Little Red Riding Hood. You may also see printable wedding invitation samples. The Little Red Riding Hood is a tale of European origin, dating back to the 17th century. We hope that this information on fairytale winter wedding invitations is helpful. Fairytale weddings are beautiful to look at, and it creates a thousand memories that can’t be matched with any monetary value. Just like in fairy tales, some of the greatest real-life love stories begin with “once upon a time” and ends with “happily ever after”.